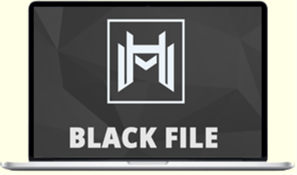 The “Black File” is a 6 week online program which sole goal is brutal mastery of paid advertising and scaling with extensive focus on HOW to make advertising traffic convert. . This program is designed for a person with an existing business that understands the basics of paid advertising. The “Black File” breaks down how to go from basic advertising to mass scaled 5 figure a day advertising PROFITABLY and the right way to structure your business/offers to finally allow your business to stop playing in the “pond” of limited Facebook traffic and start tapping into the OCEAN that is mass traffic. The first step to achieving mass scaled advertising is knowing how to use front end offers to pay for ad costs and deliver a 3-5x ROI as a bonus. With a properly structured high converting front end offer you can literally spends 10s of thousands to even hundreds of thousands a day growing your business and customer for free or even at a substantial profit. Imagine being able to get 2,000-3,000 new targeted email leads a day at no cost. In fact imagine being able to get that amount of new customers daily and get paid for it. Now that we have a CORRECTLY structured front end system to collect leads profitably it is time to connect it to mass traffic. In this phase you will see how to systematically use data collected from Facebook and Adswords to scale campaigns to 5 figures a day at a ROI in literal days. Yes. Literal days. The typical results we get when taking our perfected front end offers to paid traffic is 10k-20k a day within the first few days. We can do this because we have the exact targeting and scaling strategy blueprinted. You are getting this entire blueprint. The easiest way to grow your traffic is NOT pushing Facebook and Adwords to it’s limits with a offer that is resisting scale. The key is creating new front end offers that appeal to different kinds of people that can become your target customer. The entire point of this program is using mass traffic to scale a LONG term business and increase its overall valuation with consistent income increases. This CANNOT be done without a well structured back end to 10x the money we spend on advertising and create a stacking recurring income.